Is Cooking With Coconut Oil Healthy Or Unhealthy? Read some facts on this much debated topic - "Is coconut oil good or bad for you?" In recent years, there has been massive hype on the potential health benefits of adding coconut oil to one's diet. Even more recently, however, the oil has created mass controversy between its die-hard proponents and other health-based officials. The debate stems from the blurry facts surrounding coconut oil and how good it truly is for you. First, you’re cooking everything with coconut oil. Now, you’re afraid to feed your family anything with coconut oil. But which is it? No matter which side you take on the great coconut oil debate, the science behind the food is all the same. The answer is both. 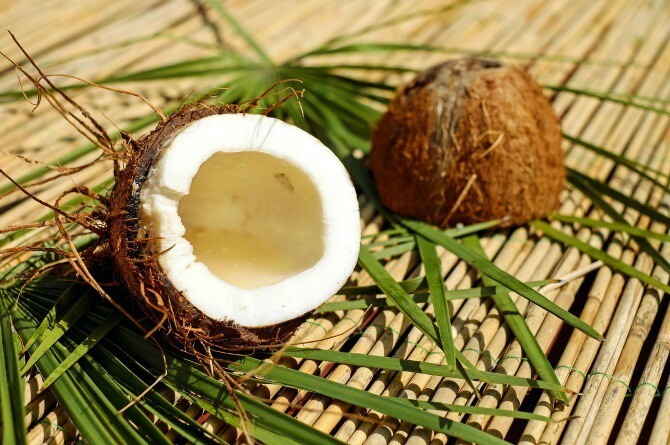 Coconut oil is comprised mostly of saturated fats, reaching over 90% of its total makeup. However, 62%-65% of the saturated fats in the oil are classified as MCT’s, or medium-chain triglycerides (fatty acids). In layman's terms, medium-chain fatty acids are better for you than long-chain fatty acids because of the way your body metabolises them. MCT’s are much easier for your body to digest and are converted into energy quickly, rather than being stored as fat. Within the 62%-65% of MCT composition, there are four different MCT’s. The most abundant medium-chain fatty acid is called lauric acid, which behaves more like a long-chain fatty acid when consumed. This means it is slower to digest and does not provide the body with quick ketone energy. Long-chain fatty acids can be unhealthy in excess and are more likely to be stored by the body as fat. The other 15% of MCT’s (caprylic acid, caproic acid, and capric acid) are beneficial but limited in quantity. In this case, the fats that are most beneficial to consume are competing with some not-so-healthy fats. The saturated fats that come from MCT’s are responsible for enhancing one’s overall health. Medium-chain fatty acids are able to increase the good cholesterol as well as decrease blood pressure. Coconut oil as a whole contains antioxidants such as flavonoids and polyphenols that are good for the heart. When the heart and blood vessels are susceptible to something called oxidative stress, plaque conforms in the arteries potentially causing a heart attack, or heart disease in the long run. The antioxidants present in the coconut oil can aid in reducing the oxidative stress process and also contribute to reducing bodily inflammation. Pure MCT oil (not coconut oil) is also used for weight loss because of its ability to convert into energy quickly rather than being stored as fat. This reduces the need to consume excessive carbohydrates for fuel, and serves as a reliable supplement for weight management. For those who find themselves in the kitchen a lot, coconut oil has a higher smoke temperature than other comparable cooking oils. The health relevance of this is that when oil starts to burn and physically smoke while being cooked, it is being broken down to produce something called free fatty acids. These compounds are correlated with weight gain, inflammation, and insulin resistance. Having a higher smoking temperature makes is slightly safer to cook with. The truth about cooking with coconut oil is that you must take the good with the bad. What most people don’t know, is that not all the effects of coconut oil are favourable. While the MCT’s are heart-healthy, the other 40%-50% of the saturated fats making up coconut oil are not medium-chain fatty acids. This portion of its composition is known to increase “bad cholesterol” (LDL) with excess consumption. Coconut oil is much higher in saturated fat (90%) than butter is (64%). In comparison to something seen as healthier than butter, olive oil contains 5-10 times more good fat than coconut oil does. Both monounsaturated fats and polyunsaturated fats are much more abundant in olive oil than in coconut oil. Olive oil too has much less saturated fats than coconut oil, but that statement isn’t positive or negative, due to the wild factor of MCT’s. When it comes to caloric intake, coconut oil is very dense, measuring up at 120 calories per tablespoon. Is Cooking With Coconut Oil Good or Bad? There is no black and white answer when it comes to should you or should you not cook with coconut oil. Like anything, too much of it can have harmful effects on the body. At the same time, the medium-chain fatty acids are a useful addition to your diet. Fats are necessary for the body to perform, but an overwhelming amount of fat can damage the heart in the long run. The most crucial point to remember is that saturated fats in moderation are no problem at all. Whether it’s coconut oil, olive oil, or even something we’ve all been coached to fear (the evil carbohydrates), moderation is key. Without carbs, you’ll have no energy. Without fats or healthy bacteria, your immune system and heart health will suffer. The list goes on. Don’t be afraid of fats, but know which ones are healthier!